Genesco Inc. said its results for the third quarter reflected solid performances at Journeys, Hat World and Dockers, partially offset by challenges at Johnston & Murphy. The company ended the quarter with 4% less inventory, thanks to solid back-to-school sales, but comps have since deteriorated and remain weak. Through November 16, same-store sales for the month were down 9%, but the company expects that to improve significantly in December and January due to the shift of Thanksgiving a week later and the arrival of new product. The company maintained its recently updated fourth-quarter guidance for same-store sales of -1% to -4%. Management remains focused on controlling store labor costs, driving sales volume and margins and managing inventory “through whatever promotions we find necessary,” said Genesco President and CEO Bob Dennis. GCO expects both real estate and supplier costs to decline as landlords and factories compete for its business in a shrinking global economy. “As we reject deals, they just keep coming back better,” Dennis said of negotiations with landlords. Net sales at the Journeys Group, which include Journeys, Journeys Kidz, Shi by Journeys and Journeys direct businesses, grew nearly 10% from the prior year period. That gain was fueled by the addition of new stores and same-store sales growth of 5% across the group. Same-store sales in the Journeys stores rose 4%, compared to a 3% decline last year. Footwear unit comps in Journeys rose 2% and average selling prices increased 4% for the quarter. Sales were driven by continued strength in the skate and women's boot business. The company said that it expects fourth quarter comps for the Journeys Group will range from negative-low-single-digits to positive low-single-digits versus a comp decline of 7% last year. Journeys men's footwear made up about 46% of total footwear sales for the quarter, while women's and kids represented the balance. Five new Journeys stores opened during the quarter, putting GCO on track to open 16 this fiscal year and end the year with 819. At Journeys Kidz, comps rose 8% in the quarter on top of a 7% gain last year. In the third quarter, footwear unit comps increased 1% and ASPs rose 8%. Nine new Journeys Kidz stores opened during the quarter, putting GCO on track to have 141 operating by the end of the fiscal year. Comps at Shi by Journeys rose 6% thanks to a larger selection of athletic products and higher priced merchandise. ASPs were up 19%. GCO now has 53 Shi stores in operation and plans to open two more in fiscal 2009 to end the year with 55. Still, Dennis said “at this point we will need to see meaningful improvement in Shi before we commit to add more stores to the chain.” At Journeys Direct, which includes both the Internet and catalog businesses, sales rose 33%, although growth slowed near the end of the quarter. Net sales at the Hat World Group increased 6% from the prior year period to approximately $93 million. Same-store sales increased 2% in the quarter, with urban stores up 4%, non-urban stores up 2% and Internet sales up 14%. Mr. Dennis estimated that product overlap between urban and suburban stores is only 20% to 30% with the urban stores featuring more hip-hop inspired product from New Era and Major League Baseball and NBA product. Meanwhile, Hat World is accelerating markdowns on NFL product, which has been weaker than expected. Operating margins expanded 190 basis points thanks to fewer markdowns on MLB inventory during the quarter. Hat World opened 14 stores and closed four and expects to open 13 more in the current quarter to end the fiscal year with 890 stores. Hat Worlds hat embroidery business, now running in 350 stores, is up 28% while blank hat sales are up 13%. Through November 16, Hat World Group's comps for the month fell 6% on top of a decline of 4% in Q3 last year. The company expects fourth quarter comps to range from up low-single-digits to negative low-single- digits as post-Thanksgiving sales are pushed into December. Underground Station Group same-store sales increased 1% versus a decline of 19% in Q3 last year. Footwear unit comps rose 10% and ASPs declined 4%. Comps deteriorated in the first 16 days of November, falling 15% on top of a 7% decline in the comp period last year. GCO is now forecasting Station fourth quarter comps in the range of negative high-single-digits to negative low-double-digits on top of a 5% decline in Q4 last year. 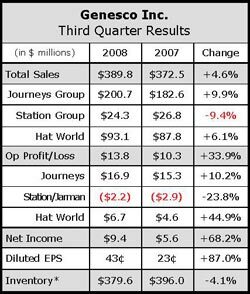 Despite its modest comp gain in the third quarter, Underground Station essentially met its profit expectations due to better-than-expected gross margins driven by changes in product mix. The company expects to end the fiscal year with 174 stores, down from 192 last year. Despite a challenging urban retail market, management is still aiming to move the Underground Station business into the black next year.